This was one of my favorite Ipsy bags I've gotten so far. 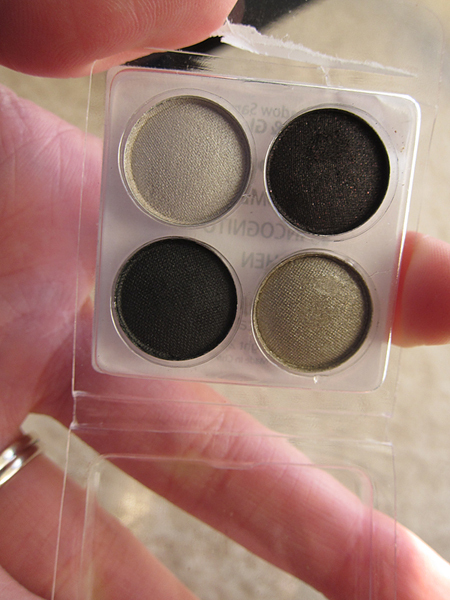 A mini eye shadow palette? Seriously? And a mini mascara, primer, and what appears to be a full-sized gel liner? Way to go, Ipsy. Way to go. I forgot to individually photograph the Lash Cards ($6.99 per pack of 10) and Pixi Flawless & Poreless primer ($29 for full size), but there wasn't much to say anyway. I haven't used the lash cards and doubt that I will. I usually just set my makeup mirror flat on my vanity and look down at it while I apply my mascara, which stops me from getting mascara on my skin. Lash cards just seem like an unnecessary step. And if you can't figure out how to put on mascara without getting it on yourself, I doubt you'll be able to finagle a lash card into place and use it properly. And I only say that because Lash Cards just look like a headache. Also, I like how the Pixi Flawless & Poreless primer made my foundation look on my skin, but it seems to really accentuate all the blackheads on my nose, which is really horrific. I bought some Bioré strips over the weekend just in case, you know, this primer was just letting me know it's time to Bioré. But yeah. Moving along. 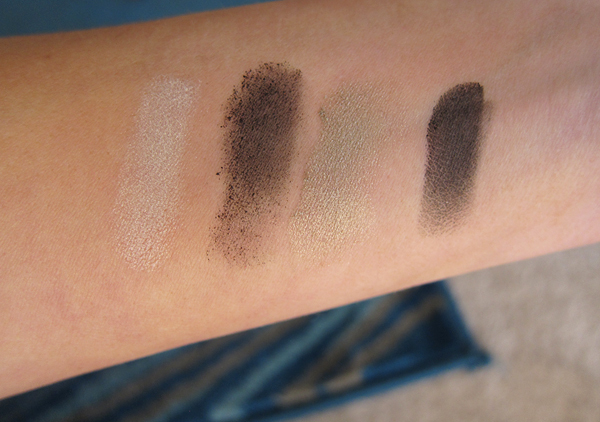 As you can see, there was a ton of fallout with that second shade, but the other three shades were of surprisingly nice quality! Definitely a step above drugstore quality. 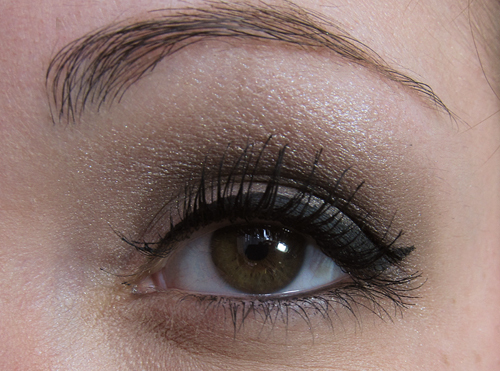 Look at that gorgeous winged liner! I will admit, it took me a smidgen longer to get the look, but gel liner is SOOOO long-lasting, and so worth the trouble if you want your liner to last! 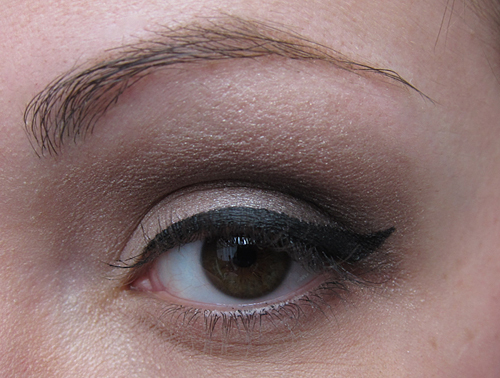 And it almost seems easier to make it a smooth line, because you're essentially painting it on with an eyeliner brush. Love it. 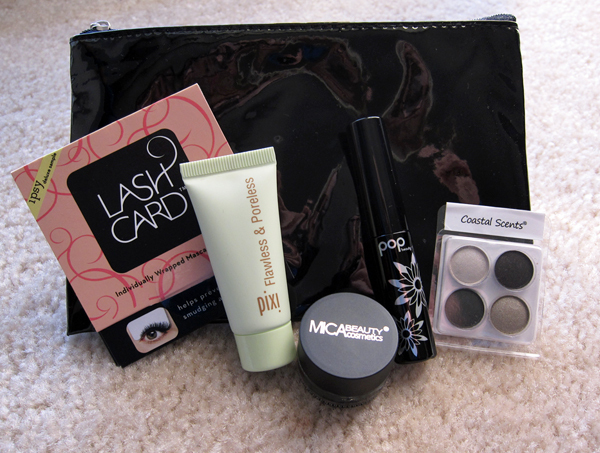 Lastly, I received POPBeauty Smokey Lash Kapow Mascara (full size is $18.50). I love receiving samples of mascara because it means I don't have to go out and buy more mascara when my current one is up. 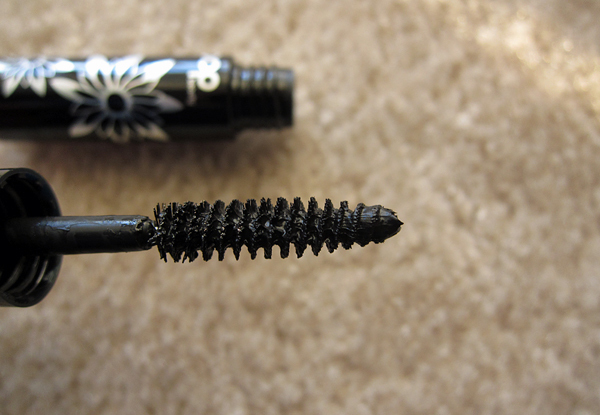 I also don't really have a "favorite" mascara, so I'm still kind of on the look out for one that really wows me. So that's it for this month! I just received my Birchbox yesterday, and while I haven't posted about it yet, I will say that I liked the contents of my Ipsy bag much more than my Birchbox. I love the quality of the samples I'm sent in Birchbox, but it's hard to beat Ipsy when they keep sending makeup samples (as opposed to tons of perfume and lotion and face washes and whatnot), even if it is just mid-range makeup. What about you ladies? Do any of you have a monthly beauty box subscription? Do you like it? Thinking of switching? Let me know! that winged liner is GORGEOUS!! & that mascara looks pretty fantastic too! i LOVE coastal scents. i have 3 of their 88 color palettes, along with some other products and you can't beat it for the price & quality! You have a great make up!!! lovely!! I tried a sample of the pixy primer recently and didn't love it, especially when i compared it to the smashbox sample i had. I love the way your lashes look in the last picture, so LONG!! I love all the colors on that pallet. I am back in town and missed your blog hun! I don't have a subscription but it looks like a good idea! Hope you had a great weekend, looks like it! Lovely haul! I would love it if you dropped by to my blog and if you like, maybe we could follow each other? what a great haul! I love how you did your eyes! I'm hosting a Blog Hop if you're interested in promting your blog?